The global micro guide catheters market is fairly consolidated with the top three vendors accounting for approximately 50.3% of the market in 2015. Transparency Market Research (TMR) notes that these leading companies – Boston Scientific Corporation, Cardinal Health, and Medtronic – hold a substantial stake in the market by offering a range of propriety technologies. The presence of numerous prominent companies makes the market highly competitive and the threat of entry by new players is quite low due to the high cost required for developing various specialized technologies. The global market for micro guide catheters is expected to rise at a CAGR of 7.5% between 2016 and 2024 and projected to reach a value of US$242.0 mn by 2024. The market had the estimated valuation of US$136.3 mn in 2016. Based on geography, the global market is segmented into Asia Pacific, North America, Europe, the Middle East and Africa, and Latin America. 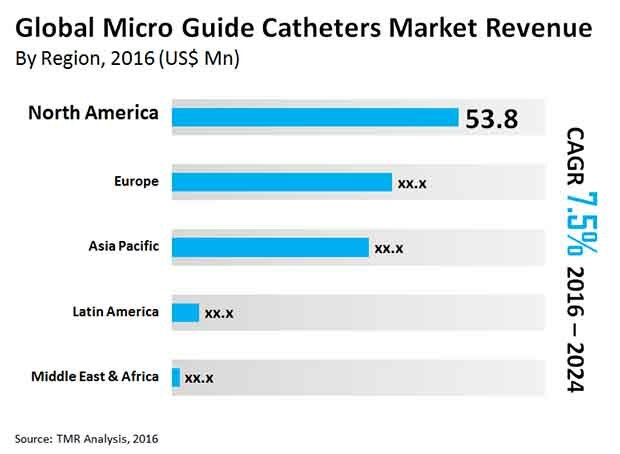 Of these, North America led the global micro guide catheters market contributing a dominant share of more than 38.8% in 2015. The market is poised to grow at an impressive CAGR along the forecast period. The substantial growth in the regional market is attributed to rapid pace of technological advancements, rising geriatric population, and increasing prevalence of cardiovascular diseases. Based on product type, the micro guide catheters market is bifurcated into over-the-wire and flow-directed segments. Of these, the over-the-wire micro guide catheter segment dominated the market in 2015; the valuation was measured in terms of demand volume and revenue generation. The product segment is anticipated to maintain its lead over the forecast period. The significant growth in the segment is driven by an increased adoption of advanced catheter technology and higher product stability. The staggering rise in the number of patients suffering from aneurysms and other types of cardiovascular diseases has led to the wide demand for micro guide catheters. Continuous technological advancements in surgical procedures have significantly enhanced medical outcomes for treating various cardiac disorders and are expected to stimulate the demand for high-end micro guide catheters. The micro guide catheters market is majorly driven by the soaring demand for minimally invasive surgical tools and equipment, rising geriatric population, and spiraling investments in healthcare infrastructure in various developed and developing economies. The lack of favorable reimbursement policies in some regions, coupled with product recalls, is a factor likely to restrain the growth of the market to some extent. However, the increasing demand for advanced micro guide catheters for treating various types of cancer and peripheral vascular diseases is expected to open up lucrative avenues for market players.